I have gone unabashedly Chocolate mad this weekend, this is a semi natural state as far as I am concerned. I love everything from White Chocolate to Dark, Forestero beans to Criollo, basically I like to eat it and eat it often. Not all my Chocolate is eaten in bar form, I think it’s great to get creative and try out new ideas when you can. When I saw the Cadbury’s shop from Collective Bias I jumped at the chance to join in. I shopped for my supplies at Asda, where I was mesmerised by the sheer selection. 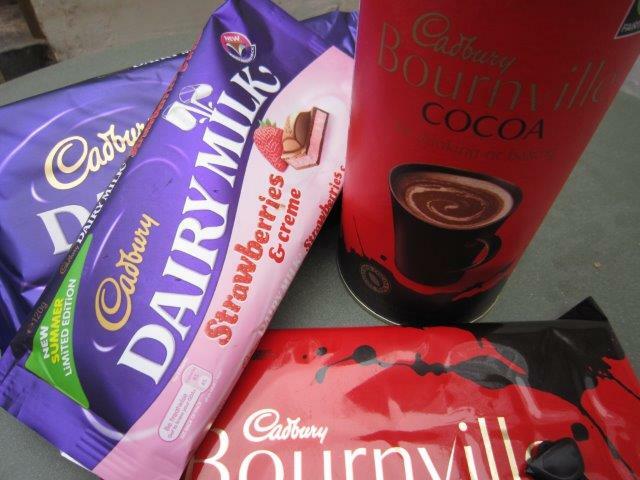 There were huge varieties of Chocolate cakes, Chocolate desserts, Chocolate bars and all of it Cadbury’s. I stuck to my list (almost) and came away managing not to eat any prematurely. To see my shopping trip take a look here. I had so many ideas (inventions) for this post that I couldn’t decide on one single Chocolate creation, so I made three and planned a little Chocolate party for our family. If my husband and I were excited, the children were ecstatic! 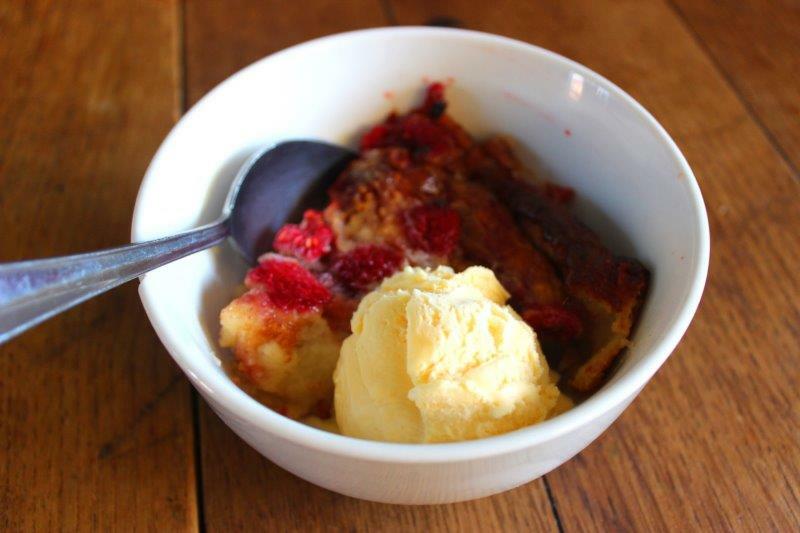 From the sophisticated and sublime to the downright silly, I had a go at creating it all! 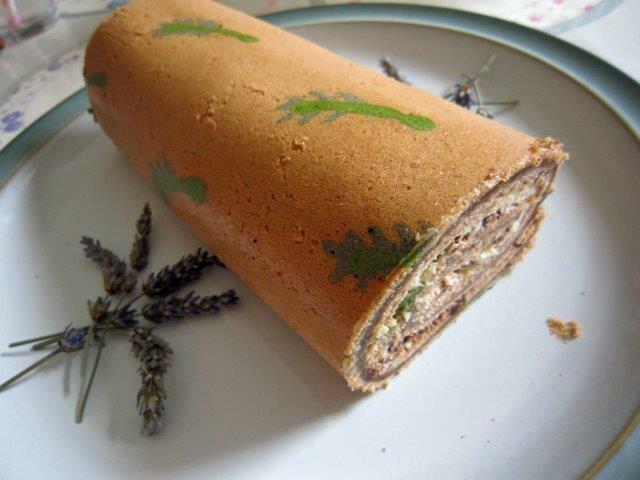 First up was my sophisticated creation the ‘Lavender Chocolate Deco Roll’. I adore Lavender cake and I’ve always wanted to make a Deco Roll so it made sense to try and combine both ideas, thankfully it worked! 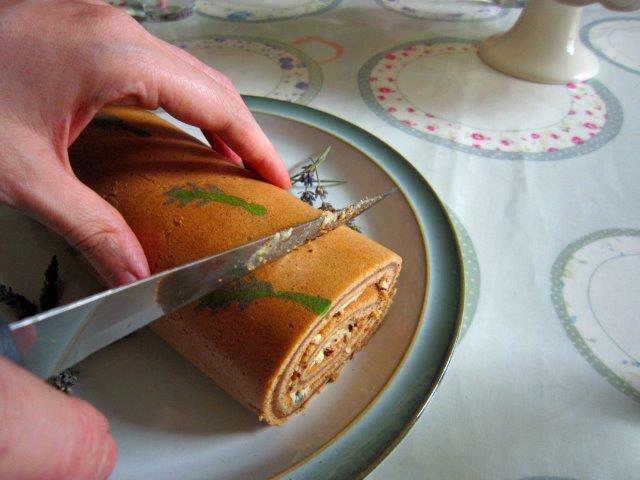 If you’ve never seen a Deco Roll before, they are Swiss rolls with pictures piped right into the cake. Take a look around the web to see some truly astounding creations. 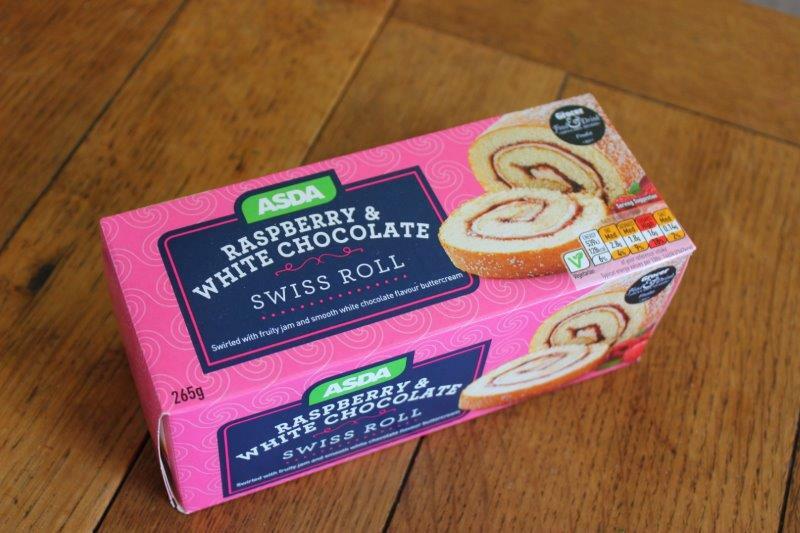 I believe they are Japanese in origin and add a level of creativity and whimsy that is otherwise severely lacking from your standard Swiss roll. You’ll probably see that many of the recipes are in Japanese, which causes a slight problem unless your happen to speak that language. I managed to find a brilliant tutorial/recipe on YouTube. 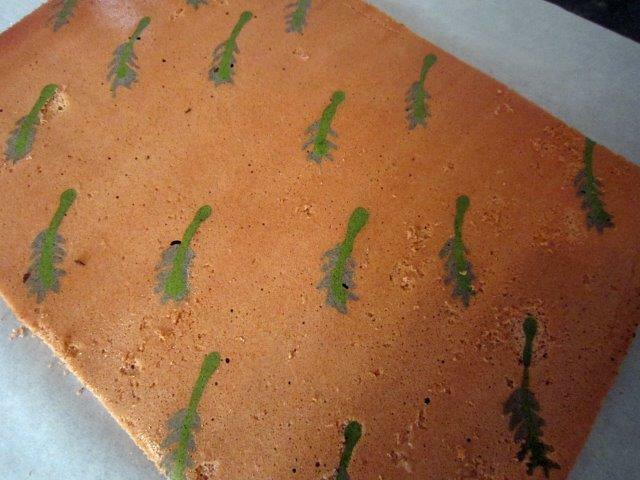 Basically you make an egg yolk batter which is coloured and then piped onto a silicone baking sheet in your chosen design (I drew Lavender sprigs). 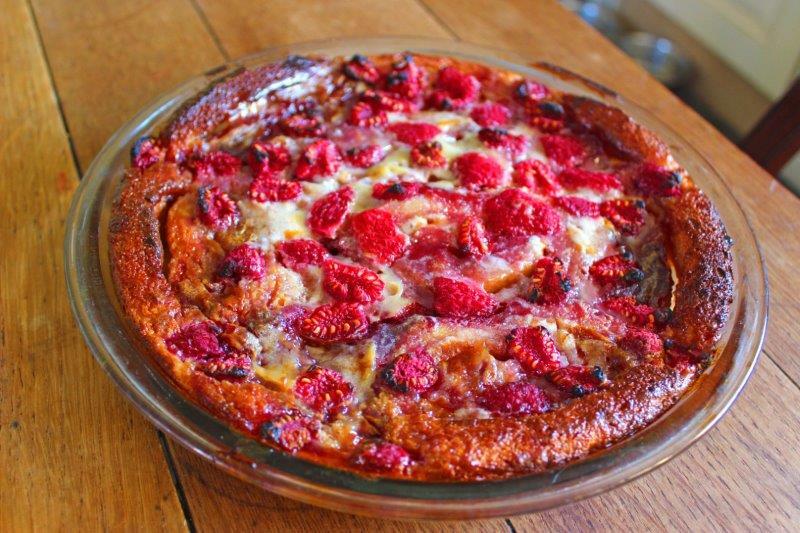 This is baked for just 1.5mins, before making the cake batter which is spread over the top. 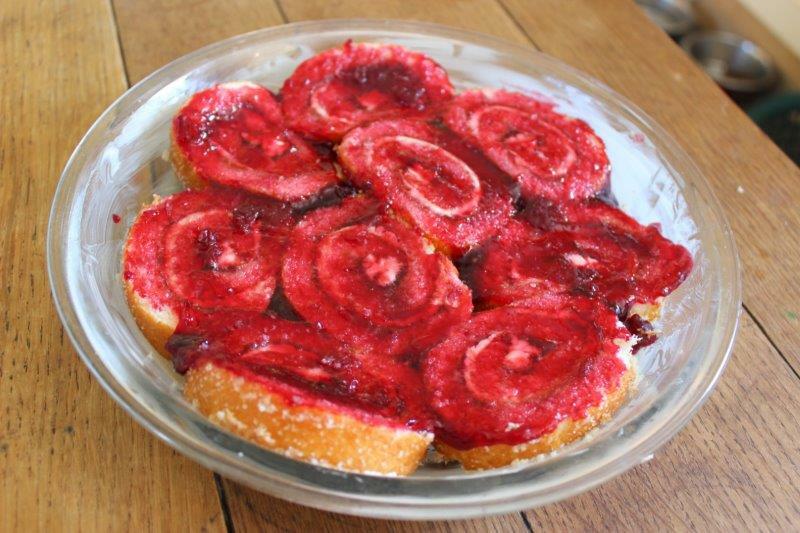 The end result…wonderfully decorative Swiss rolls. For my variation, the Cake Batter had some cocoa added. Then I cut some fresh lavender from the garden and sprinkled it over whipped cream with sugar for the filling. 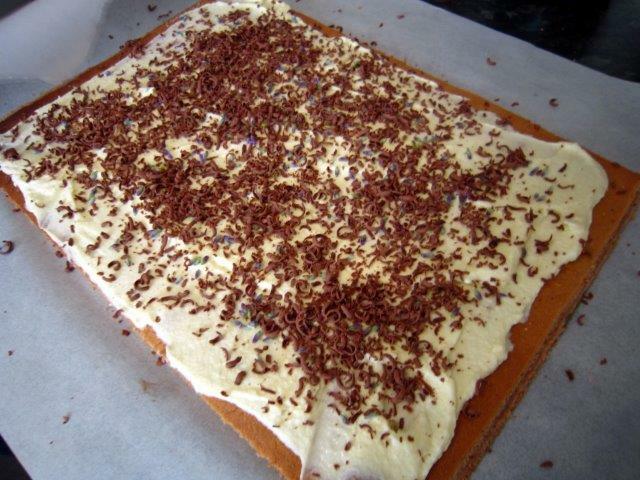 Next I added grated Cadbury’s Bournville before rolling up. The Deco Roll needs to be in the fridge for at least a day to firm up. I know I made this and I don’t want to sound big headed, but this cake rocked! 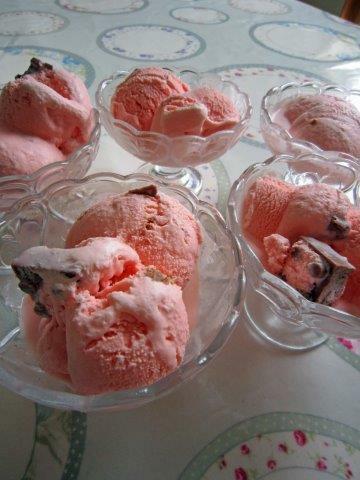 I used my trusty ice cream maker, of course it can be made without one but it takes more time. 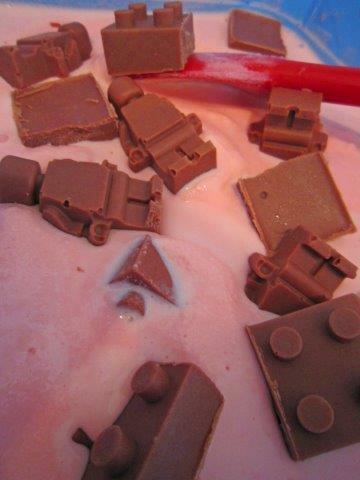 Then I placed the Lego blocks and Lego men into the ice cream and mixed before placing into the freezer for a couple of hours. 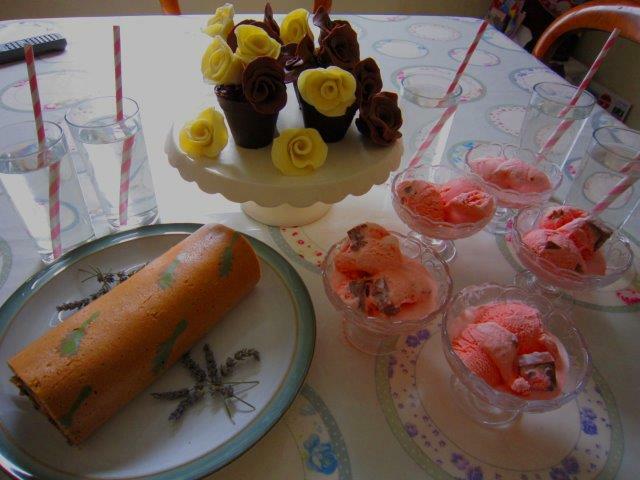 This is the funniest and tastiest summer ice cream I’ve made, the kids routed through and squealed everytime they found a man or brick, great fun for a summer afternoon. 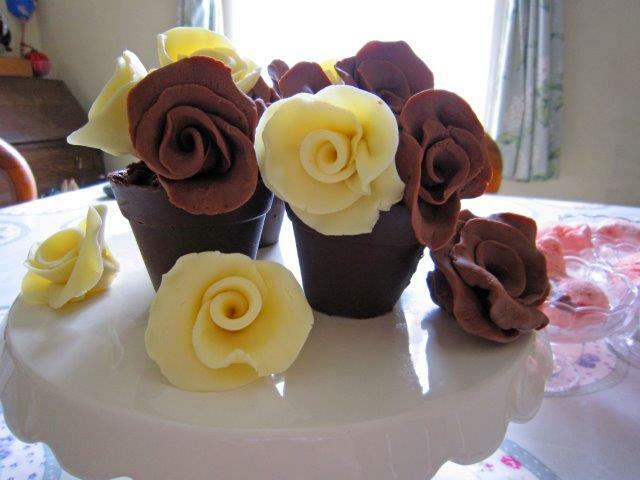 Finally I had another new idea, Chocolate Roses in pots 🙂 I am so chuffed with how these turned out. New ideas are always nerve wracking, so I was over the moon with the end result. First I painted the inside of some silicone pots with melted Cadbury’s Bournville. I built up several layers to give the pots a good thickness before leaving to set. While these were drying I made a quick batch of Brownies (using Bournville Cocoa of course). 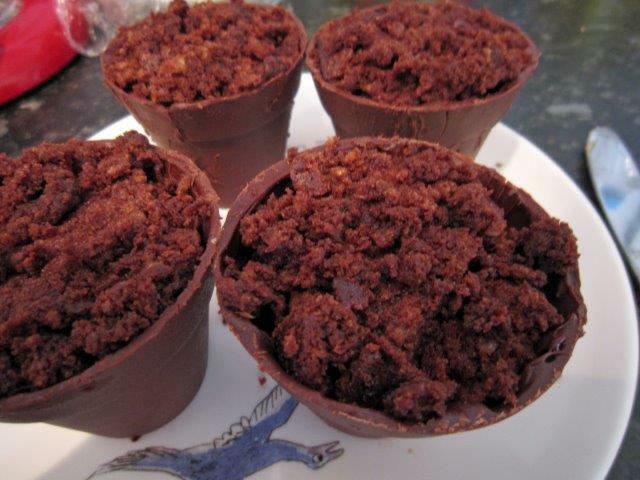 I filled the set choc flower pots with the brownies, making sure to crumble some up on the top so it resembled soil. Mmmmmm….. tasty, tasty soil! Then I made a batch of Dairy Milk Modelling Chocolate. Modelling chocolate is really fun to work with and fairly easy to make (but expensive to buy). Essentially you are adding something like liquid glucose or golden syrup to melted chocolate, I found this easy to follow tutorial on a site called Cakes Decor. Once mixed and cool you end up with a pliable chocolate that bends to your whim, although it can melt and set quickly so don’t make too much at once. 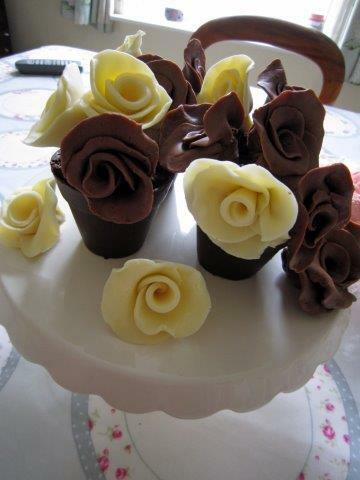 I made mine into Chocolate Roses. They are deceptively easy to make, cut several thin circles of modelling chocolate, roll one up tightly to make the rose centre. Thin the edges of your remaining circles and layer them around the sides. Pinch off any excess at the back and then push some wire in for your stem. I left them to set and then placed them into the chocolate flower pots. As you might imagine we all had an amazing time sampling these Chocolate creations, I think I might have to make Chocolate Parties a regular event! 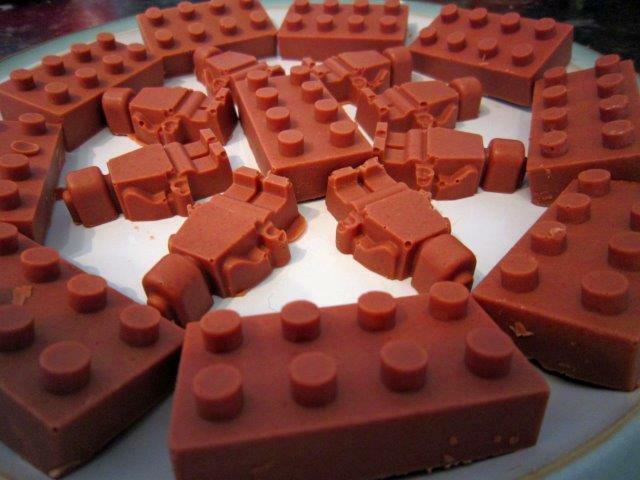 When else could you eat a flower pot, rose or Lego man without a trip to the local hospital!